The current level of monetary policy uncertainty is low by historical standards. One important question is whether this low uncertainty–perhaps reflecting confidence among market participants–manifests in pronounced movements of medium- and long-term interest rates when a monetary policy surprise is delivered. This note provides empirical evidence suggesting the answer to this question is “yes”: after a monetary policy surprise, the reaction of medium- and long-term interest rates is more pronounced when the level of monetary policy uncertainty is low. In explaining this result, we find that after a given monetary policy surprise, primary dealers–key intermediaries in interest rate markets–tend to adjust their positions in the U.S. Treasury market and their exposures to interest rates more when the prevailing level of policy uncertainty is low than when it is high. Federal Reserve communications has changed significantly over the past two decades and have become increasingly transparent.2 Through the early 1990s, monetary policy decisions were not announced to the public. Today, the FOMC uses a variety of tools to communicate its economic outlook, policy decisions, and views about the policy path–including FOMC statements and minutes, post-meeting press conferences, the Summary of Economic Projections (SEP), as well as testimonies and speeches. In part reflecting these changes, the perceived uncertainty about the path of monetary policy has changed noticeably over time. 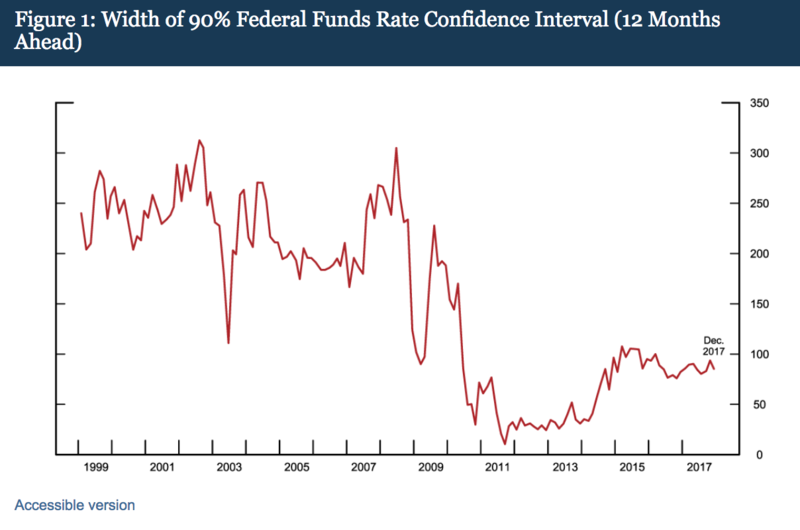 Figure 1 shows one measure of this uncertainty: the width of the federal funds rate one year ahead implied by derivative prices.3 As is evident, monetary policy uncertainty fluctuated pronouncedly in the early 1990s and 2000s, reached its nadir following the financial crisis–when the federal funds rate was at the zero lower bound and forward guidance was in effect–and moved up some in recent years as the FOMC has begun to lift interest rates away from the zero lower bound. Despite some increases in recent years, the prevailing level of uncertainty is still quite low by historical standards. This note examines how the reaction in interest rates to monetary policy surprises depends on the prevailing level of uncertainty surrounding the path of monetary policy. We find that medium- and long-term interest rates respond more to policy surprises when uncertainty is low. To explain these findings, we conjecture that market participants are more confident about the future path of monetary policy actions–and therefore willing to take riskier positions–when monetary policy uncertainty is low; in such circumstances, the pass-through of monetary policy surprises to interest rates is sizeable as market participants have to adjust their exposures whenever a surprise materializes. Consistent with this conjecture, we find that primary dealers–the most important financial intermediaries in interest rate markets–adjust their interest rate positions and Value-at-Risks (VaRs) more upon a monetary policy surprise when uncertainty is low than when uncertainty is high. To the best of our knowledge, we are the first to empirically evaluate this conjecture. For the remainder of this note, we use changes in the two-year nominal Treasury yield during a 60-minute window around FOMC announcements as our proxy for monetary policy surprises.7 We then study the impact of these monetary policy surprises on medium and long-term yields on U.S. nominal Treasury and Treasury Inflation-Protected Securities (TIPS). We are interested in the role that the level of monetary policy uncertainty plays in these regressions. where d is the (second) day of a scheduled FOMC meeting; ΔfmdΔfdm is the two-day change from d-1to d+1 in the nominal or real Treasury yield, with maturity m equal to either 5- or 10-year; ΔmpdΔmpd is the 60-minute change in the two-year Treasury yield around the FOMC policy announcement — our measure of monetary policy surprises; Uncertainty d−1Uncertainty d−1 is the one-year ahead measure of monetary policy uncertainty implied by federal funds futures and Eurodollar futures options shown in Figure 1, measured on the day before an FOMC meeting. 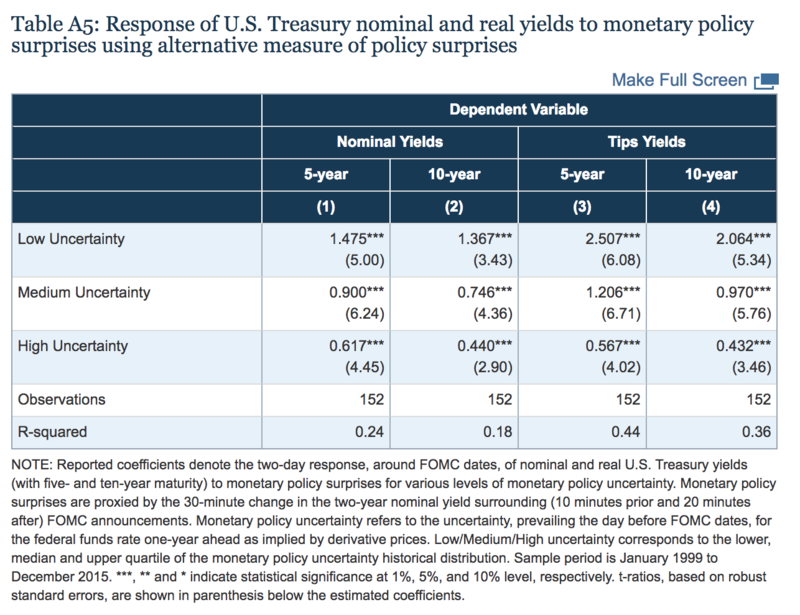 Table 1 reports the estimates of the response of nominal and real yields to a monetary policy surprise, when the one-year ahead measure of monetary policy uncertainty is low, medium, or high–that is Uncertainty d−1Uncertainty d−1 is equal to the value corresponding to the 25th percentile (81 basis points), median (183 basis points) and 75th percentile (234 basis points) of its distribution, respectively.11 Columns 1 and 2 use the 5- and 10-year nominal rate as dependent variables, respectively; columns 3 and 4 use the TIPS-implied real rates at those two horizons. The estimated effects suggest that positive monetary policy surprises, or “tightening” surprises, are associated with an increase in nominal and real rates, but this increase is muted during periods of high monetary policy uncertainty. Based on columns 2 and 4, for example, a 10 basis point monetary policy surprise (approximately a two standard deviation move) is associated with roughly a 7 and 9 basis point increase in 10-year nominal and real rates, respectively, when the level of monetary uncertainty is at its median value. The response of nominal and real rates falls, however, to about 4 basis points, when the uncertainty about monetary policy is at the upper quartile of its distribution. These results are consistent with the literature arguing that monetary policy surprises, as measured by high-frequency movements in short-term interest rates, have large effects on long-term interest rates (Gilchrist, Lopez-Salido, and Zakrajsek, 2015; Gertler and Karadi, 2015; Hanson and Stein, 2015; Nakamura and Steinsson, forthcoming). Our findings complement these existing studies by showing that the pass-through of monetary policy surprises to longer-term yields depends on the prevailing level of monetary policy uncertainty. The appendix at the end of this note shows that these results are robust to several alternative specifications, including the use of forward rates instead of yields as dependent variables; alternative measures of monetary policy surprises; and the exclusion of FOMC meetings with decisions and communications related to the Fed’s LSAP programs. 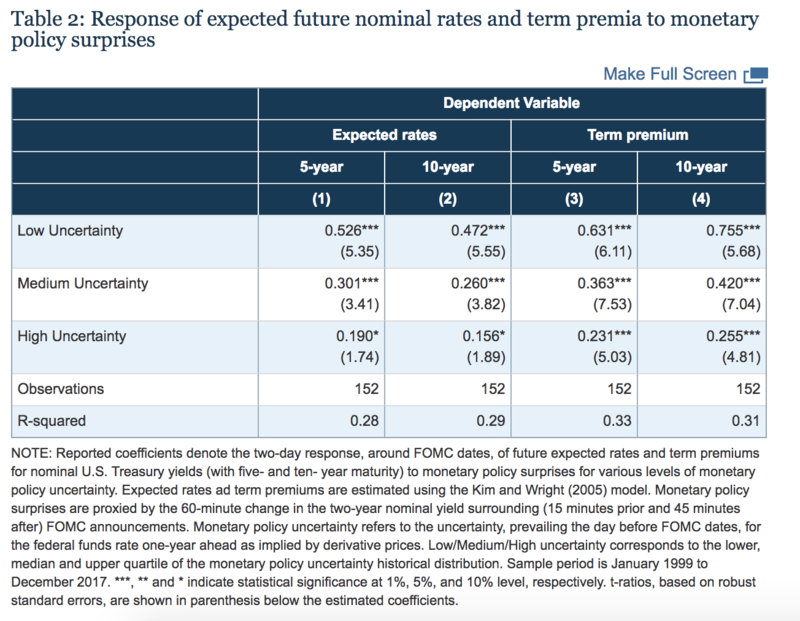 As shown in Table 2, the response of nominal rates to monetary policy surprises reflects predominantly changes to term premiums. 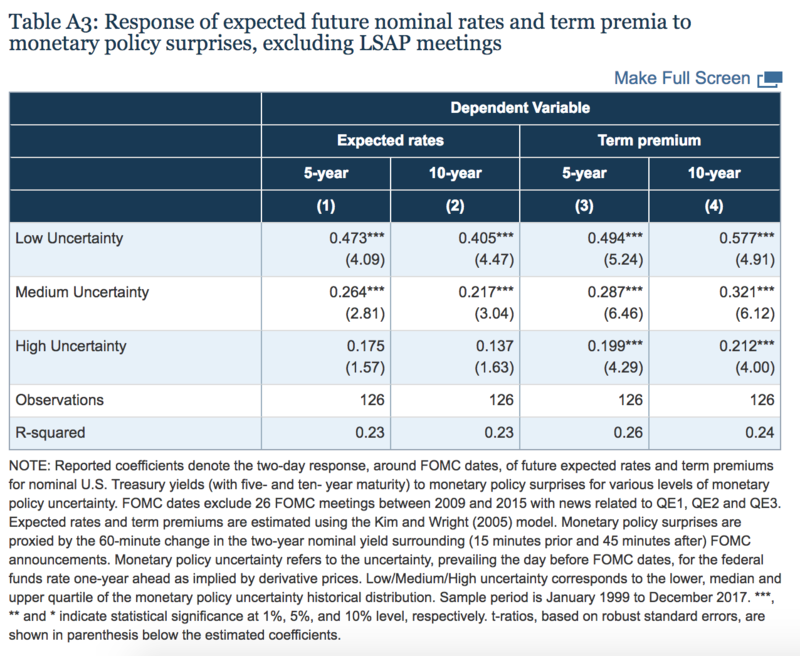 For example, when uncertainty is at its 25th percentile, the effects in columns 3 and 4 suggest that the response of 5- and 10-year term premium, respectively, is about one-and-a-half times larger than those of the expected short rate (shown in columns 1 and 2). These results are consistent with those of Hanson and Stein (2015), who argue that a tightening surprise causes long-term yields to rise because yield-oriented investors sell long-term bonds, above and beyond what is required by the revelation of news about the expected path of policy. 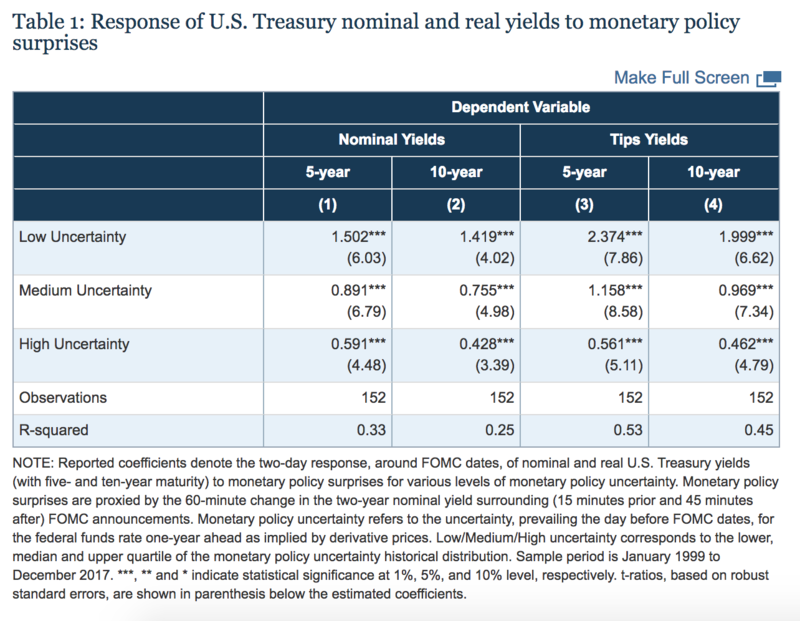 Similar to the results in Table 1, the higher monetary policy uncertainty, the smaller the responses–when uncertainty is at its 75th percentile, a 10 basis point tightening shock solicits a 2.5 basis point increase in the 10-year term premium, which is a bit less than half of the response–4.2 basis points–when uncertainty is at its median value. Why are the effects of monetary policy surprises large when the level of uncertainty is low? To explain the above findings, we explore the effects of monetary policy surprises on market participants, focusing on primary dealers–the most important intermediaries in interest rates markets and for which risk exposure data is available. 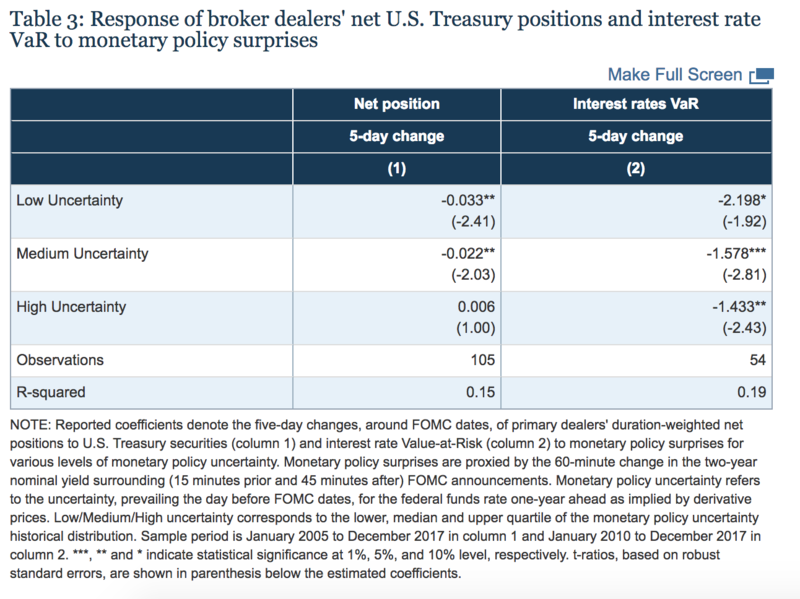 Our hypothesis is that when uncertainty is low, dealers are positioned more aggressively in interest rate markets, and find themselves having to adjust their exposures substantially when a monetary policy surprise realizes. To test this hypothesis, we focus on two related but distinct measures of risk-taking: changes in the duration-weighted net position of primary dealers in U.S. Treasury securities, and changes in the interest rate Value-at-Risk (VaR).13 The former captures the directional exposure of primary dealers in cash U.S. Treasury securities and forward contracts; the latter is a broader, “tail loss” measure of the interest rate trading book, encompassing both cash and derivative positions under interest rate trading desks. We use the same regression framework employed earlier to derive the results in Tables 1 and 2, but now replacing the dependent variable with the 5-day change around the day of a monetary policy announcement in either the average dealer’s net position in Treasury securities or in the average interest rate VaR. When the dependent variable is the VaR, we also include the 5-day change in the interest rate volatility as measured by the MOVE index as additional control variable, as VaR could increase mechanically as interest rate volatility increases. This notes provides evidence that medium and long-term interest rates respond more to monetary policy surprises when the prevailing level of uncertainty about the path of monetary policy is low. This evidence points to a non-trivial tradeoff for central banks’ communications. On the one hand, clear communication enhances policy effectiveness by moving interest rates in a way the central bank intends. On the other hand, communications aimed to cement market expectations about the future path of policy may lead to large changes in long-term interest rates and thus financial conditions when a policy surprise materializes, upending the central bank’s intentions. Baker, S.R., N. Bloom, and S. Davis (2016), “Measuring Economic Policy Uncertainty”, Quarterly Journal of Economics, Vol. 131. (No. 4), pp. 1593-1636. Gertler, M., P. Karadi (2015), “Monetary Policy Surprises, Credit Costs, and Economic Activity”, American Economic Journal: Macroeconomics, Vol 7. (No. 1), pp. 44-76. Gilchrist, S., D. López-Salido, and E. Zakrajšek (2015), “Monetary Policy and Real Borrowing Costs at the Zero Lower Bound”, American Economic Journal: Macroeconomics, Vol 7. (No. 1), pp. 77-109. Gűrkaynak, R. S., B. Sack, and E. T. Swanson (2005), “Do Actions Speak Louder Than Words? The Response of Asset Prices to Monetary Policy Actions and Statements”, International Journal of Central Banking, May, pp. 55-93. Hanson, S. E. and J. C. Stein (2015), “Monetary policy and long-term real rates”, Journal of Financial Economics, Vol. 115 (No. 3), pp. 429-448. Iercosan, D., A. Kumbhat, M. Ng, and J. Wu (2017), “Trading activities at systematically important banks, part 1: recent trends in trading performance,” FEDS Notes, Washington: Board of Governors of the Federal Reserve System, July 10, 2017, https://doi.org/10.17016/2380-7172.2023. Kim, D and J H. Wright (2005), “An Arbitrage-Free Three-Factor Term Structure Model and the Recent Behavior of Long-Term Yields and Distant-Horizon Forward Rates”, FEDS Working Papers2055-33. Mallaby, S. (2017), “Why the Fed Should Surprise Us More”, Wall Street Journal, June 23, 2017. Nakamura, E. and J. Steinsson (forthcoming), “High Frequency Identification of Monetary Non-Neutrality: The Information Effect,” Quarterly Journal of Economics. Stein, J. C. (2014), “Challenges for Monetary Policy Communications”, speech delivered at the Money Marketers of New York University, New York, May 6. Wynne, M. A. (2013), “A Short History of FOMC Communications”, Federal Reserve Bank of Dallas Economic Letters, Vol. 8 (No. 8). To assess the robustness of the results in Tables 1 and 2, this Appendix reports a battery of alternative empirical tests. Table A1 uses the one-year forward nominal and real rates, ending in five- and ten-year-ahead, as dependent variables. 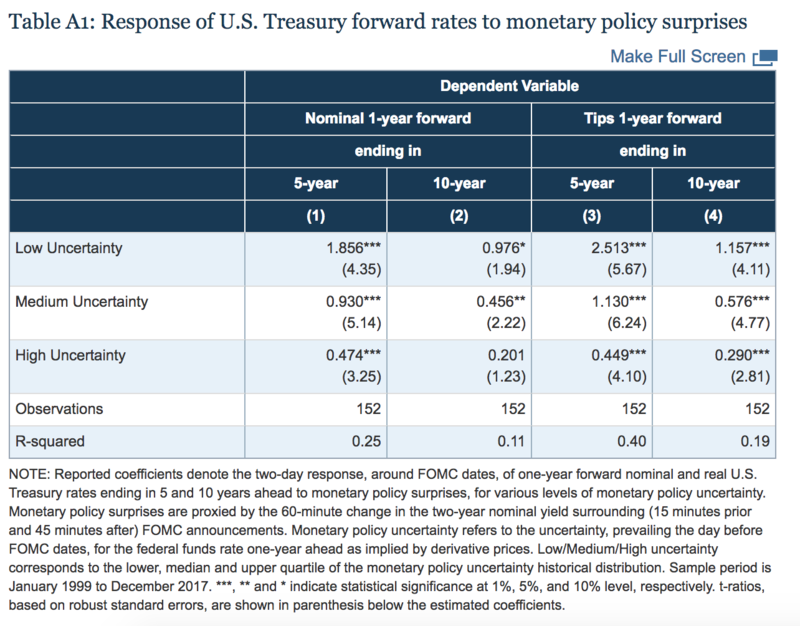 As shown, the reaction of forward rates to monetary policy surprises follows the same pattern of yields documented in Table 1: nominal and real forwards rates increase following monetary policy surprises, but the increase is muted when the one-year ahead measure of monetary policy is higher. Tables A2 and A3 check that the main results are not driven by unconventional monetary policy announcement, by excluding meetings with news related to the Fed’s LSAP program. As shown, the responses of both yields and term premiums are essentially unchanged even after excluding 26 FOMC meetings between 2009 and 2015 with news related to QE1, QE2 and QE3. 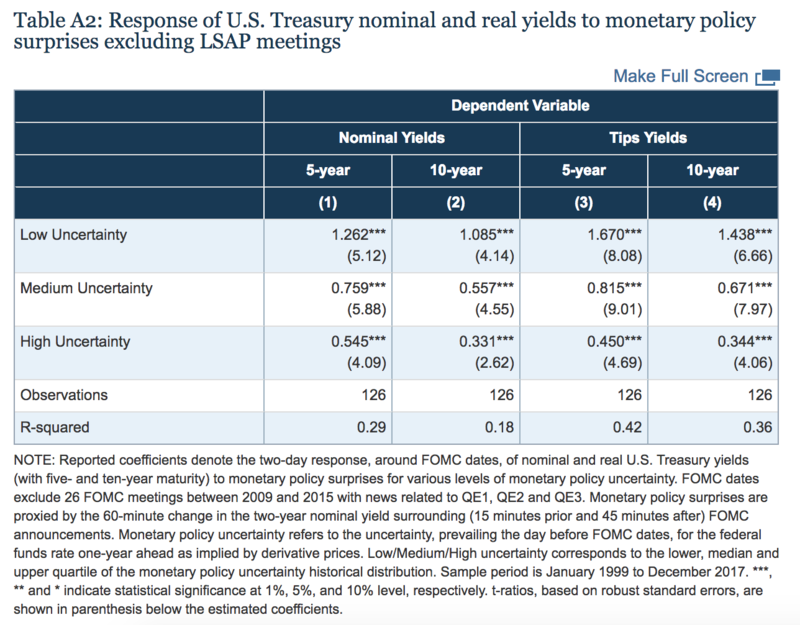 Table A4 uses a different time window to measure changes in nominal and real yields. In our baseline specification we use two-day changes in 5- and 10-year yields around an FOMC meeting to account for the possibility that the full reaction of longer-term yields to an FOMC announcement may not be instantaneous (as documented, for example, by Gűrkaynak, Sack, and Swanson, 2005). As shown, our main results are qualitatively and quantitatively similar if we use, instead, the 60-minute changes in five- and ten-year yields around the policy announcements. Finally, Tables A5 and A6 assess the robustness of the main results to two alternative measures of monetary policy surprises. 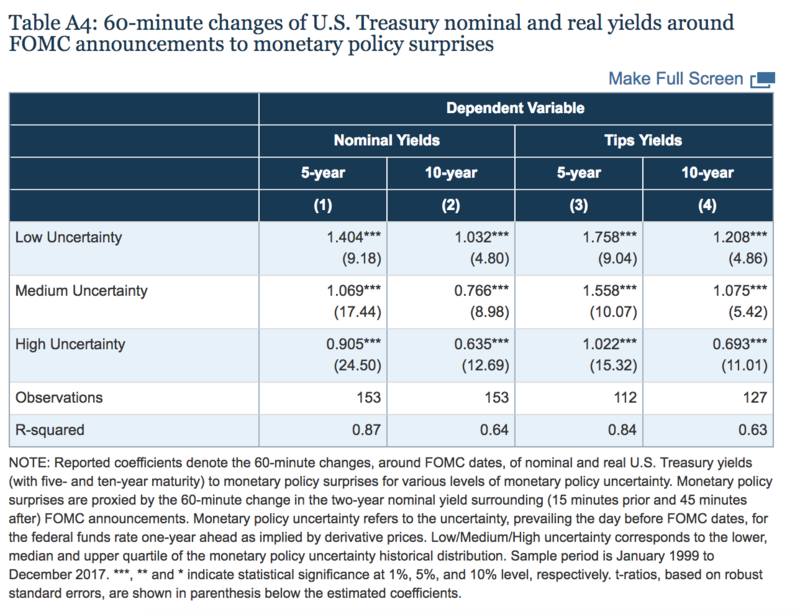 In Table A5, the policy surprise is computed using the change in the two-year Treasury yields in a tighter window of 30-minute around an FOMC announcement, as opposed to a 60-minute windows as in the baseline specification. 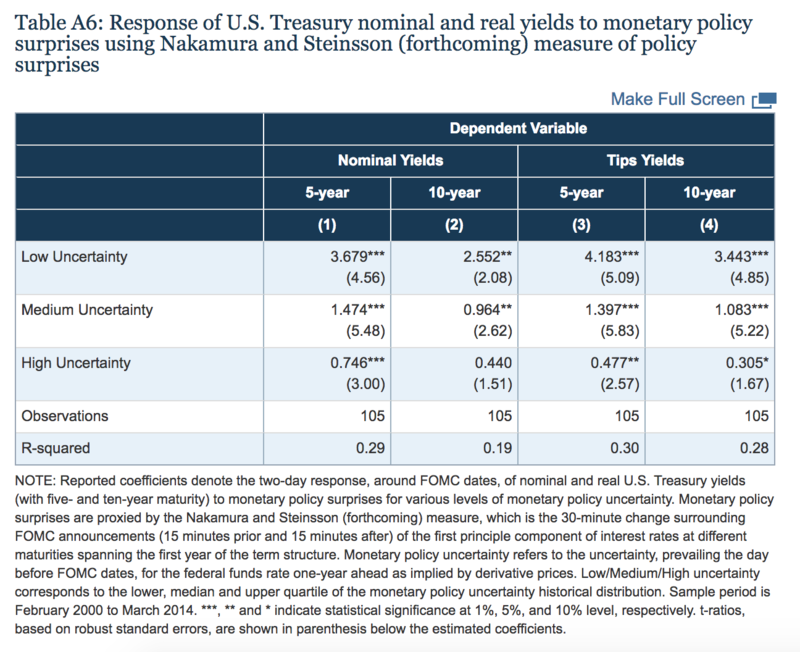 In Table A6, we use the monetary policy surprise of Nakamura and Steinsson (forthcoming), which is based on the 30-minute change surrounding FOMC announcements of the first principle component of interest rates at different maturities spanning the first year of the term structure. In all instances, the main findings that the response of medium and long-term yields to monetary policy surprises is muted during periods of high monetary policy uncertainty continue to hold. Please cite this note as:De Pooter, Michiel, Giovanni Favara, Michele Modugno, and Jason Wu (2018). “Monetary Policy Surprises and Monetary Policy Uncertainty,” FEDS Notes. Washington: Board of Governors of the Federal Reserve System, May 18, 2018, https://doi.org/10.17016/2380-7172.2176.